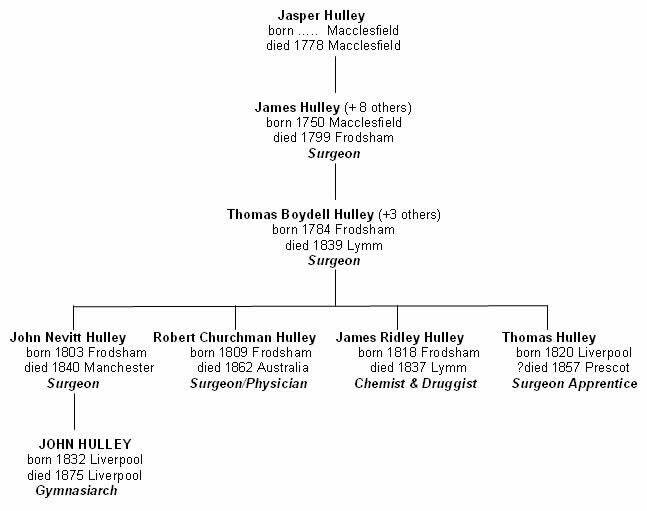 See www.hulley.info for details of Hulley family history worldwide. Please contact me if you know of or require more information about John Hulley. In particular, information is sought concerning the current location of the John Hulley carved bust last known at the Liverpool Sports and Pastimes Exhibition at the Gymnasium Myrtle Street in 1885. 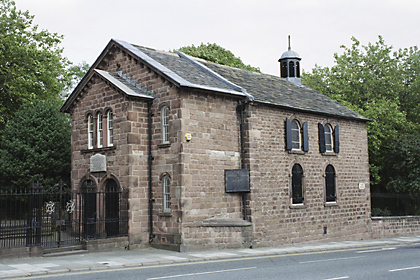 On 16 July 1869 at the above chapel John married Georgiana Bolton, only daughter of Mr. Robert Lewin Bolton, merchant of Liverpool and grand-daughter of the late Mr. Thomas Bolton who was Mayor of Liverpool in 1840. The marriage was an explosive affair with her parents locking her in her room to prevent the ceremony from going ahead. However, love prevailed in the face of adversity and the happy couple tied the knot a day later. This attracted widespread press coverage throughout the country and several reports of the on-off-on marriage are shown here. A daughter, Georgiana Theodosis, was born in December 1870. She went on to marry a Liverpool steam and tugboat owner, William T. Jolliffe, on 14 Novmber 1895 at Hampstead parish church, London. For some time in the early 1870s he had suffered from a chest complaint which necessitated his removal from England to a warmer climate during the severity of the winter. Reports show that he lived in Algiers, Nice and other Mediterranean resorts during these periods. 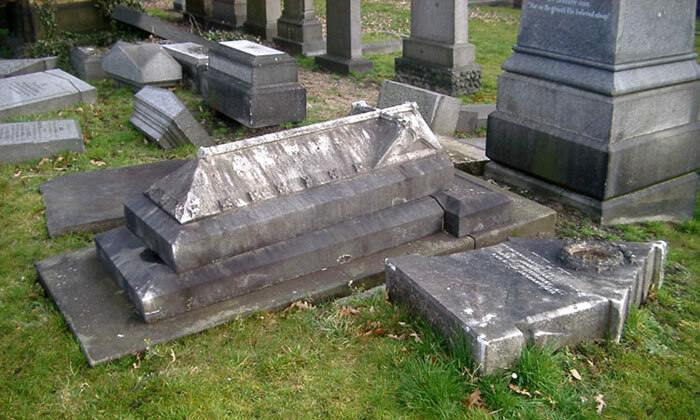 He finally succumbed to his complaint on 6 January 1875 when he died at his home of Emphysema of lungs and Bronchitis. 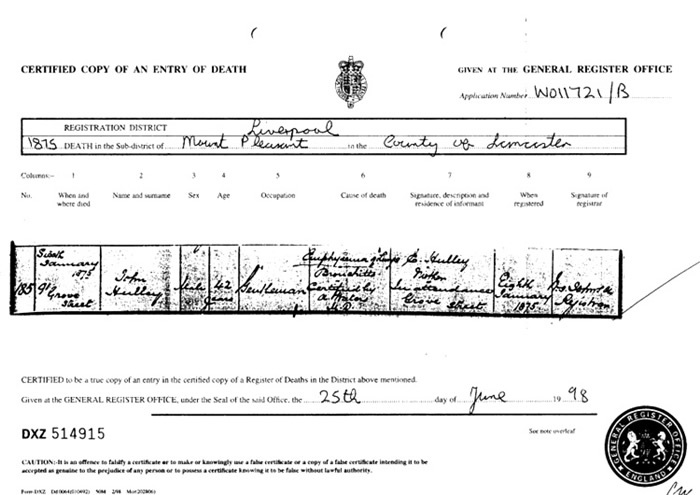 He is buried in Grave G493 in Toxteth Park cemetery, Smithdown Road, Liverpool. The funeral of the late Mr. John Hulley, the "gymnasiarch," took place yesterday morning at the Smithdown-lane cemetery, the body being conveyed in a hearse drawn by four horses, and followed by two mourning coaches and the private carriage of Mr. Aaron Brown. Amongst those present at the grave were Colonel Faulkner, Mr. Councillor Thomas Avison, Mr. Aaron Brown, Mr. Miller, Mr. Shrapnell, manager of the Gymnasium in Myrtle-street, &c. The officiating minister was the Rev. Hugh Stowell Brown, Baptist minister, who, in the course of some remarks which he delivered in the chapel, referred to the fact that Mr. Hulley for several years had escaped death by going to reside during the winter in warmer climates than ours, but the late severe weather had proved fatal to him as it had to many more. In a measure they were indebted to Mr. Hulley for the interest that had been taken in athletic exercises, and for the establishment of the institution in Myrtle-street, of which he was the first manager. He (Mr. Brown) believed that the institute had been productive of very great benefit to the young people of the town, for not only did those exercises benefit the pupils in bodily health, but they led to the cultivation of manly habits, of temperance, and of self-denial, and so acted upon the moral character as well as the physical frame. St. Paul had made excellent use of the exercises of the gymnasium as illustrative of the spiritual efforts that must distinguish the Christian life. Other reports are shown here.